In this review I’m taking a look at Naturepedic’s organic cotton sheets. After already testing several other Naturepedic products I was pretty excited for this test. These sheets are 100% organic cotton and created by one of the most reputable companies when it comes to healthy and organic products. Continue reading below for my full review or if you’re in a bit of a rush, click here to jump to the review summary. The Naturepedic organic cotton sheets are woven from 100% organic cotton. The organic cotton is certified by GOTS, the Global Organic Textile Standard. This certification assures that the cotton is grown without herbicides, synthetic insecticides, or GMOs. These sheets use a sateen weave. Sateenis one of the most common types of weaves. The sheets are woven so that there are more fibers on the fabric surface. This creates a smoother and more luxurious finish. They have a thread count of 300. Thread count is an important consideration, but it isn’t everything. Many companies use manipulative thread counts to try and indicate their quality (i.e., be careful with companies claiming super high thread counts, often times they are not a true indicator of quality). These Naturepedic organic cotton sheets are 100% machine washable and dryable. One of the most common complaints for all sheets simply comes down to the fit. As such, Naturepedic has created both a standard and deep pocket version. The standard pocket sheets fit mattresses up to 12″. The deep pocket version fits mattresses up to 18″ thick. The sheets are available in all standard mattress sizes, including Twin, Twin XL, Full, Queen, King, and California King. Additionally, they are available in two colors, white and ivory (which is a bit of an off-white cream color). When I look at the build quality of sheets I am primarily focused on materials, stitching, and overall construction. Regarding the materials used, it’s hard to imagine a healthier or more eco-friendly cotton. Naturepedic only uses Global Organic Textile Standard cotton, which in addition to certifying that the cotton is 100% organic, it also assures that the cotton was grown with respect to both the environment and to the workers growing and harvesting. The stitching on the Natureperdic organic cotton sheets is virtually flawless. I closely analyzed every inch of stitching across the flat sheet, fitted sheet, and pillow covers. The only slight flaws I found were two 1/4″ loose threads on the flat sheet and two 2″ loose threads on the interior of the pillow covers (one on each cover). Beyond these minor issues, the stitching was tight and neat from seam to seam. Overall, I’m impressed with the build quality. The materials are grown with both the sleeper’s health and environment in mind and the stitching is well done. 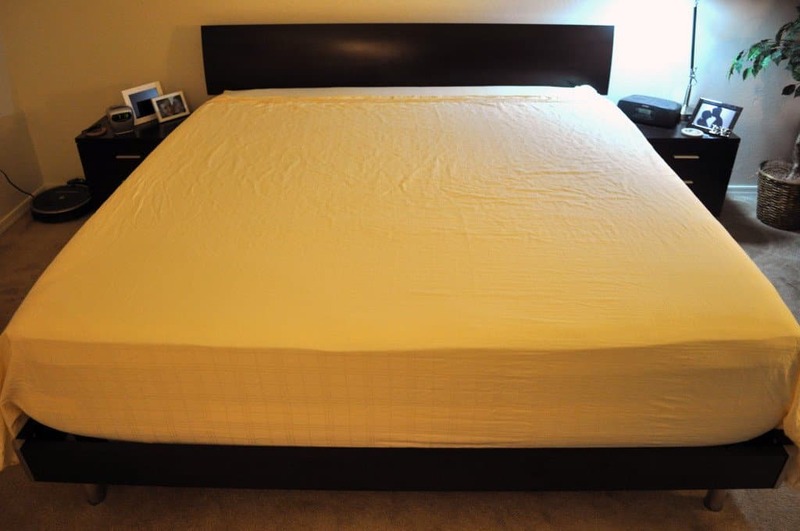 To test the durability of the Naturepedic organic sheets I looked at a few different factors. First, up, shrinkage. A sheet set that dramatically shrinks after washing / drying is always a major concern. Not only could this cause the fit on your mattress to be off, but it could also indicate a lower quality cotton. Second, I looked for damage to the sheets as a result of regular use and washing / drying. Are threads coming out? Are the existing loose threads getting worse? Is there any other damage to the decorative portion of sheets, stitching, or seams? Last up, I analyze the dyes and colors used in the fabric to ensure the colors won’t run. Shrinkage Test – for my shrinkage test I first took measurements of the pillow cases and flat sheet. This served as my baseline. I ran the sheets through a standard wash and low heat dry and took a second set of measurements to determine if the sheets had shrunk. In my test I saw a 4.6% decrease in the size of the flat sheet compared to the baseline and a 3.7% decrease in the size of the pillow cases compared to the baseline. I would consider both of these to be within normal limits (anything less than 5% is good). Most shrinkage will occur on the first wash / dry. I would not expect significant continued shrinkage on future wash / drys. 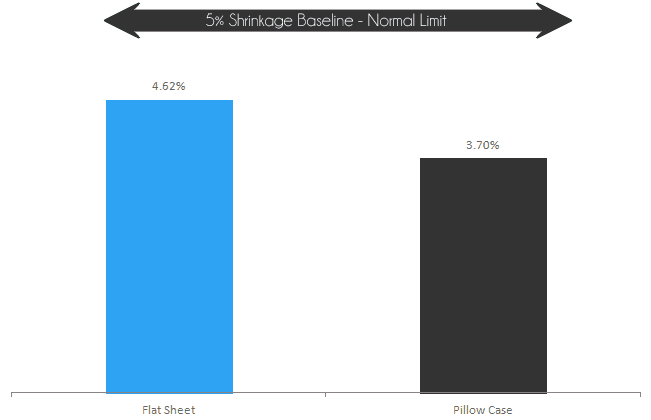 Shrinkage Test – flat sheet shrank by 4.62% after washing / drying. Pillow case shrank by 3.7% after washing / drying. Damage Test – in this test I am looking for damage that could have resulting from regular use or washing and drying. Machine washers can certainly take a toll on bedding. Prior to washing the sheets were in near flawless condition (there were only a few notable loose threads, see above for more info). After several weeks of use and washing / drying the sheets I did not see new dramatic damage or change to the existing flaws in the stitching. There only noticeable damage was one additional loose thread (about 1/3″ in length) that appeared on the decorative portion of the cover. Color Test – for this test I soaked a pillow case in hot water, allowing it fully absorb the water. Next, I wrung excess water out by hand and then placed the pillow case on a bed of paper towels. Finally, I used a rolling pin to press the pillow case into the paper towels before allowing the pillow case to air dry. 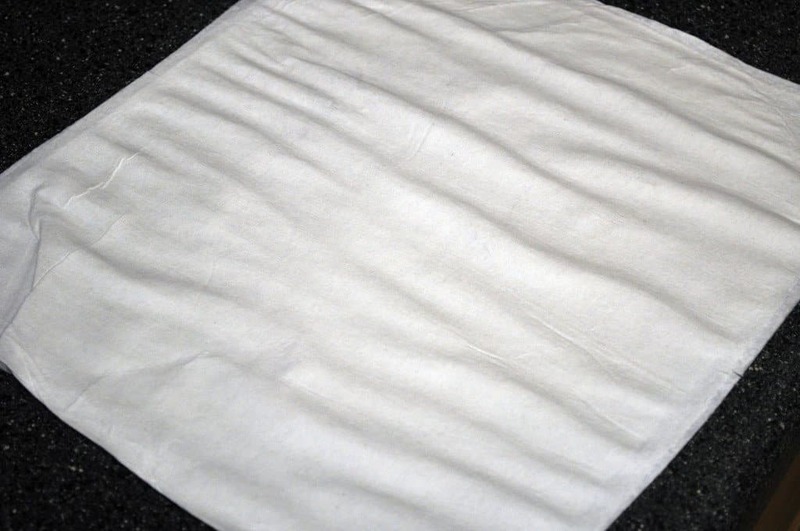 Lower quality sheets would easily allow the dye to run into the paper towels. The Naturepedic organic cotton sheets passed with flying colors. There was zero discernible dye transferred from the fabric to the paper towels. Color test – paper towel after pressing the wet sheets into the towels. Zero color transfer. The overall feel of Naturepedic’s organic cotton sheet set is quite good. The sateen weave gives the sheets a smooth feel from top to bottom. The sheets have a subtle checkerboard pattern woven in, which adds to the aesthetic appeal. Determining whether a set of sheets is too soft or too rough is always difficult due to the subjective nature of feel. In general, I feel that these sheets have an average to slightly above average level of softness to them. On a scale of 1-10, where 1 is the most soft, I would rate these sheets at a 4-5 out of 10. 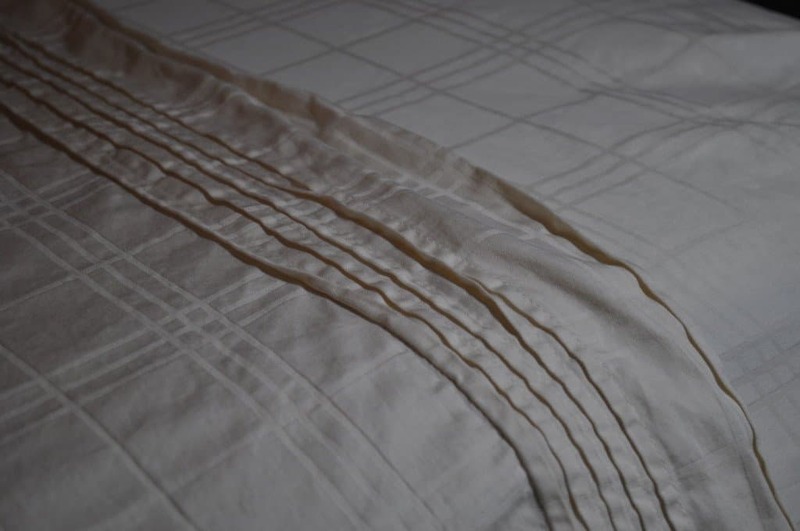 Despite the average level of softness, the sheets do have a wonderful crisp and smooth finish (most likely a result of the sateen weave and organic cotton itself). The biggest con to these sheets (applies to most cotton sheets) is the wrinkle factor. Bottom line, cotton is going to wrinkle. There’s just not much getting around it. The sheets are ironable, so if keeping a neat and pressed look is important you aren’t out of luck. While this is a bit of a negative, I consider it to be fairly minor given the other benefits of having organic cotton. Naturepedic’s organic sheets are intentionally not treated with anti-wrinkle chemicals. You could certainly find sheets that won’t wrinkle elsewhere, but they also won’t be as healthy or as organic. What I like most about these sheets is simply the usage of organic cotton. Many companies are moving away from cotton to other materials and fibers. Naturepedic’s commitment to doing the basics, but doing them at an extremely high level is commendable. You will be hard pressed to find a better set of certified organic cotton sheets elsewhere. I would also describe the cooling as being above average. Cotton in general does a great job of allowing the sheets and your mattress to breathe, improving airflow. If you have a warm mattress these sheets are not going to be a miracle worker. However, if your mattress does a good job of allowing air to flow easily these organic cotton sheets will help to continue to facilitate cooling, resulting in a cool sleeping surface. Should you buy the Naturepedic organic cotton sheets? The Naturepedic organic cotton sheets are an all around great product. They utilize high quality materials, have a subtle classic design, and have been built to the highest standards. Want healthy & eco-friendly sheets – 100% organic cotton certified by the Global Organic Textile Standard (GOTS). Not only does this certify that the cotton is 100% organic (no synthetic insecticides / herbicides, and no GMOs), but it also assures the highest standards of worker health, welfare, and safety. Want exceptional durability & build quality – the durability and quality was evident immediately out of the package, but even after running a series of performance tests the sheets continued to hold up well. There was no dramatic shrinkage after washing / drying, stitching was tight, and the colors don’t run even under extreme pressure. Want to buy from an established and reputable organic company – Naturepedic has been in business for many years. They produce the highest quality organic and healthy products across the board. I have tested several different Naturepedic products, including their mattress protector, latex pillow, and cotton pillow. Thus far, they have met or exceeded all of my expectations. For more information about the Naturepedic organic cotton sheets visit Naturepedic.com. The Naturepedic organic cotton sheets are a healthy and Eco-friendly alternative to other synthetic sheet sets. The 100% certified organic cotton materials and impressive build quality combine to deliver a high quality healthy sheet set that is sure to last years. The sateen weave creates a smooth finish that’s neither too soft or too rough. 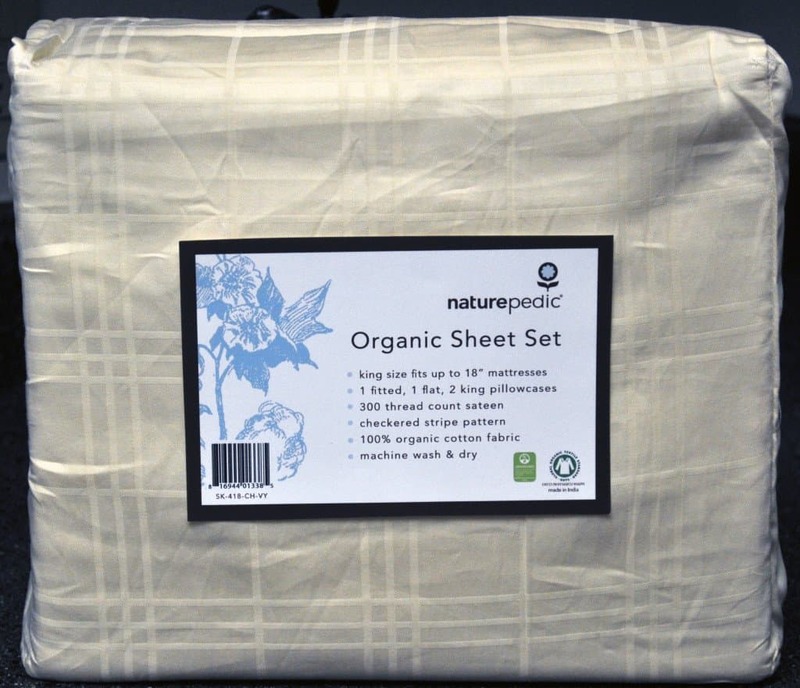 A very good sheet set to anyone looking for a healthier organic sleeping experience.